Studies on elec­troen­cephalog­ra­phy (EEG) based brain– com­puter inter­faces (BCI) in the past have focused mostly on real time task pro­cess­ing such as using brain­waves for moving an object on the screen but more recently, there has also been a push towards using BCI for track­ing emo­tional states or intentions. To what degree users are aware of their influ­ence on the system? 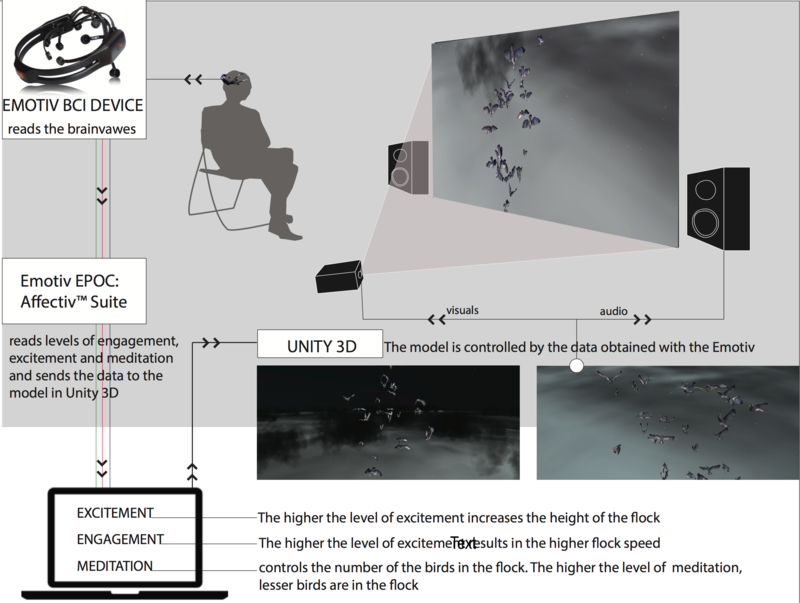 A vir­tual envi­ron­ment in Unity3D in form of an art instal­la­tion incor­po­rat­ing an EEG-based brain com­puter inter­face (BCI) is placed in a dark room, with a video pro­jec­tion dis­play­ing a computer-animated flock of birds. 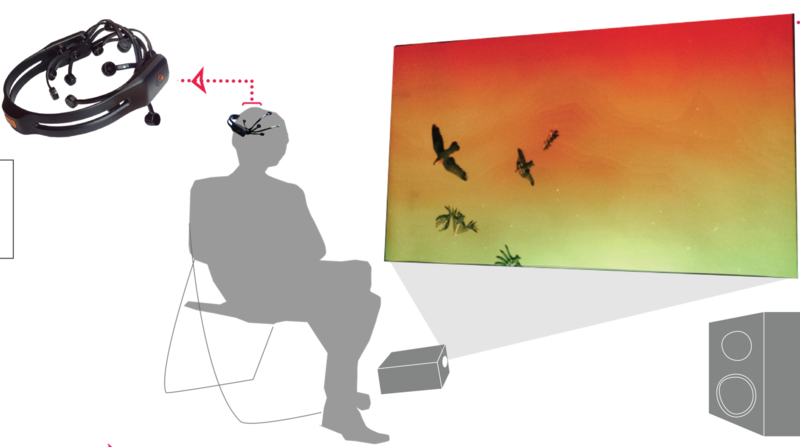 Simulation para­me­ters (e.g., number of birds, flying speed and motion type, as well as ambi­ent sound­scape) either directly cor­re­sponded to the user’s cur­rent state assessed in real-time either by an Emotiv Epoc EEG head­set (exper­i­men­tal con­di­tion) or were ran­domly gen­er­ated (as a con­trol condition). The results cor­rob­o­rate the poten­tial of BCI-supported inter­ac­tive immer­sive envi­ron­ments. Even though the par­tic­i­pants didn’t know which emo­tional state was mapped to which sim­u­la­tion para­me­ter, the results demon­strate that par­tic­i­pants were in most cases able to rec­og­nize the pat­terns of changes in the sim­u­la­tion and relate those to their inner feel­ings at that moment. This, in turn, directly affected their degree of immer­sion in the environment. Prpa, M., Miucin, S., & Riecke, B. E. (2014). Towards User Personalized Environments: an Artistic Exploration Using an EEG-Based Brain-Computer Interface,. Poster pre­sented at the Academy of Neuroscience for Architecture (ANFA) Conference, La Jolla, CA, USA.